The Wine Room at Wolf Creek Resort’s recent grand opening saw the beautifully appointed jazz cabaret filled to capacity. City of Big Bear Lake councilpersons joined representatives from San Bernardino County Supervisor James Ramos’ office and the Big Bear Chamber of Commerce to cut the red ribbon to symbolically open the room. The room, which holds just under 100, rose from a humble beginning to true grandeur in the space of only a few short months. When Wolf Creek Lodge owner Dave Stone first envisioned using the space, he planned to construct a commercial-grade laundry. However, with a mercurial tap of his magic building wand, Stone decided to instead build a first-class entertainment center. There is a giant, walk-in wine refrigerator holding hundreds of chilled wine bottles of exceptional vintage. The walls of the room have been hand painted with outdoor scenes and the centerpiece is the music area a baby grand piano anchors the spot where jazz ensembles perform. The Wine Room will have entertainment on the weekends. Besides great music, the room offers an exceptional selection of wines to enjoy as well as a signature-label brew, Stone Summit Beer, or a variety of other beers on tap or by the bottle. Comfort is the key, and the room is decorated with plush chairs and couches. It’s a perfect place to sink back into luxury while enjoying music and fine libation. One of the featured jazz ensembles is the Real Jazz Trio which features Wolf Creek Wine Room entertainment director Mike Cross on the 88, Mark Cade on standup bass and Steve Boggio pounding out the rhythm. 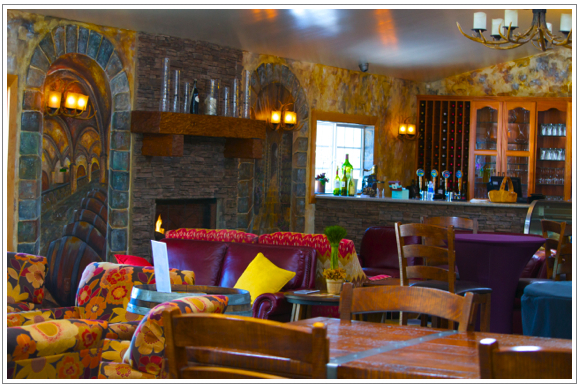 The Wine Room is at 41421 Big Bear Boulevard in the city of Big Bear Lake.